Jim O’Neill is Honorary Professor of Economics at Manchester University. He worked at Goldman Sachs from 1995 until April 2013, serving as Chief Economist and head of Economics, Commodities and Strategy Research before becoming Chairman of Goldman Sachs Asset Management. He became well known in the world for creating the BRIC acronym in 2001. He was Chairman of UK’s City Growth Commission until October 2014. From 2014 to 2016, he chaired the review on anti-microbial resistance. He was Commercial Secretary to the UK Treasury from 2015 to 2016. Though global trade has helped to lift billions out of poverty in recent decades, there is an increase in protectionism and a growing populist backlash against globalization, especially in the advanced countries. Some experts have warned that the zero-sum mentality prevalent in some countries could trigger a trade war to the detriment of the global economy. Recently, former UK Treasury Commercial Secretary Jim O’Neill, who coined the term “BRIC,” discussed globalization and world trade with CSST. CSST: What do you think is the main reason for the rise of protectionist, anti-globalization sentiment in advanced countries? Joseph Stiglitz said that despite GDP growth in recent decades, the fruits have gone to a relatively small group at the top because developed countries have failed to introduce policies to ensure the gains were widely shared. Is increasing inequality the root? Jim O’Neill: I think this is a typical simplification, and while it does reflect popular perception, it is not true. For example, here in the United Kingdom, inequality as measured by the Gini coefficient is actually slightly lower than it was around 20 years ago, despite what people think about it. This is primarily because taxation of higher-income people has risen, while that for lower incomes has declined. In some places, such as the United Kingdom, where reported income equality has improved, once house prices are taken into account, wealth inequality has risen. At the same time, many people do not seem to realize it, but the UN goal of halving poverty by 2015 set in 2000 was actually achieved by 2010. If we continue the trends of the past 20 years or so, some estimate that by 2035, poverty, as defined by the UN, will be eradicated in all parts of the world, except for Africa. This is remarkable, and it is something to be championed. Even if inequality has risen, so long as it is accompanied by hundreds of millions being lifted out of poverty, I do not think it will be a massive problem. I personally believe it is most important for societies to have equality of opportunity, especially with respect to educational opportunity and health. CSST: What can be done to address the anti-globalization, protectionist populist reaction? 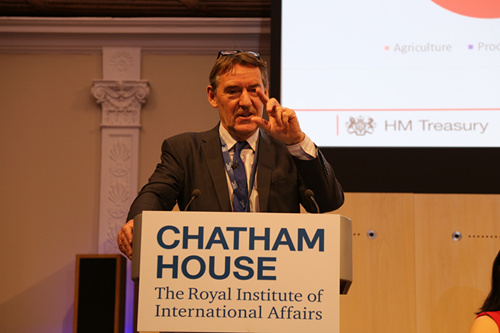 Jim O’Neill: If the trends we have seen, very recently, literally since late 2016, continue, world GDP growth will improve so much that popular perceptions that emerged in recent years will fade. Many indicators I follow suggest a marked acceleration of world GDP growth to more than four percent, the highest since the 2008 crisis. To supplement this, especially if growth were to slow again, I think policies to allow labor to have stronger nominal wage growth and to make it more challenging for Western companies to make genuine profit rather than just be more clever at balance sheet management, are crucial. We need to see Western multinationals discover “enlightened self-interest” and stop being so focused on simply their quarterly reported balance sheets. If we get more economic growth, and it involves many different parts of the world, I personally think the mood about anti-globalization will not be as bad as it has been in the past year or so. What is quite striking about recent signs is that many parts of the world seem to be doing better at the same time. In all of the United States, Europe, China, India, there are signs of improved growth, and if this continues, I am not sure how much of this negative mood will remain. Now this being said, I do believe that things need to be done to improve the consequences of globalization. One of the peculiar things is that the publicly reported profit share of global GDP for multinationals has basically risen for most of the past 30 years. This does not really make sense according to neoclassical economic theory. In principle, after many years of strong profits, new entrants are supposedly attracted to the industry in order to chase the same profits, and as a result, the overall profitability declines as there are more competitors. This has not happened in many instances in practice, and it is not clear why. It could be that industries make it very difficult for new entrants. Whatever the reason, multinationals need to use this long period of profits to invest in their own businesses as well as think more about the externalities their industry may create, and some market failures. CSST: Some critics consider globalization to be a zero-sum game, but you do not think they are right. What is your argument here? Jim O’Neill: It is quite simple. World trade is one of those very few things that benefit the world and all 7 billion of us. Despite all the concerns about the challenges of post-2008 world growth, so far this decade, world GDP growth has seen an average growth rate the same as that of the previous 30 years. The whole fundamental belief of international economics is partially built around the assumption that international trade benefits all, and helps lift many boats. Countries are naturally better and more effective at producing certain things—often at a better rate of productivity than other countries. For example, think about the role of Apple in the United States and China. For the past two years, China has been the most important market for their iPhone sales, more important than the United States. An iconic US company that has been one of the biggest technological innovators for the past 20 years, Apple sells more to Chinese consumers rather than the United States today. Is Apple a US company? It is, in terms of technology and knowledge and where profits are distributed, but in order to make it so effective, it has a lot of its components built elsewhere, including China. Would we want this to stop? Of course not. Would Donald Trump want this to stop? Also, again, of course not. CSST: Will Donald Trump’s decidedly protectionist attitude send global trade into a long retreat and jeopardize globalization? What needs to be done about this? Jim O’Neill: I believe we have been in an era for a long time—about 16 years since I coined the BRIC acronym— in which the United States has not dominated global trade in the way it once did. If the United States chooses this path, it is their mistake. The most interesting economic data I have seen this year so far shows that Germany’s biggest trade partner is now China. Trump and his advisors are living with a mindset of 25 years ago. There are all sorts of positive possibilities for global trade that does not involve the US. For example, China’s idea of the “Belt and Road” initiative-this could be a massive stimulus to trade involving all those developing countries to the west of China, and east of Europe, which could benefit many places, including Europe and China. Today, much of South Asia does not trade much between them. Pakistan and India in particular, as a result of their histories, do virtually none, which is economically ridiculous. If they did, it would help both, probably substantively, and create the basis for a more peaceful relationship between these two large, populous countries. In Africa, we have growing talk of an African free trade deal, which could be fantastic for this continent that has been so much left behind in terms of world growth and poverty. All of these things could happen in the next 20 years, and they could all happen regardless of the US stance on free trade. CSST: How will the world economy interact with globalization? What would you say are the major challenges ahead and how can they be addressed? Jim O’Neill: I think there will always be challenges. As I said earlier, if I look at the indicators I trust, the world currently looks as though it is experiencing stronger growth than it has since 2008. The cycle for coming months looks very strong. As always, there are all sorts of risks out there. The biggest issues in the world are the rise of China, the associated rise of their consumers, and the challenges of the relationship between the US and China. CSST: How has China’s role changed in globalization as it transforms from an export-driven model to one more reliant on domestic consumption? Jim O’Neill: It is slowly progressing, and this is absolutely key for the world. China becoming more consumer driven is really good for its more than 1.3 billion people, and means that its engagement in international trade will shift. The winners overseas will be different, and this probably means those countries with more value-added exports, therefore perhaps more-advanced manufacturers and service providers, including the United States, will benefit. CSST: Since you coined the term “BRIC” in 2001, how have been the BRIC countries fared? How have they interacted with globalization and what is their way ahead? Jim O’Neill: I created the BRIC acronym in 2001 because I believed after 9/11 and all its horrors, it is peculiarly a symbol of the fact that globalization had become too American, and for globalization to thrive, it needed to become less dominated and driven by the United States. On virtually any measure, this is precisely what has happened in the past 16 years or so. The United States used to be the source of 20 percent of global imports, and today, it is around 15 percent. As I said earlier, China is close to becoming as big an importer as the EU, and consistent with my BRIC thesis, by 2037, now 20 years away, I still think it is quite possible that the combined size of the BRIC economies might be bigger than that of the current G7 countries.